How does a biblical theology of the mission of God guide the American Church in the 21st century? How does the increasingly pluralistic and global character of the American context shape the Church’s engagement with that context? How might the experience of early urban Christians help the Church to answer these questions? And what are the implications of those answers for Christian mission today? Christian mission to an increasingly post-Christian society is the focus of the third annual Ancient Evangelical Future Conference, June 4-5, 2015. 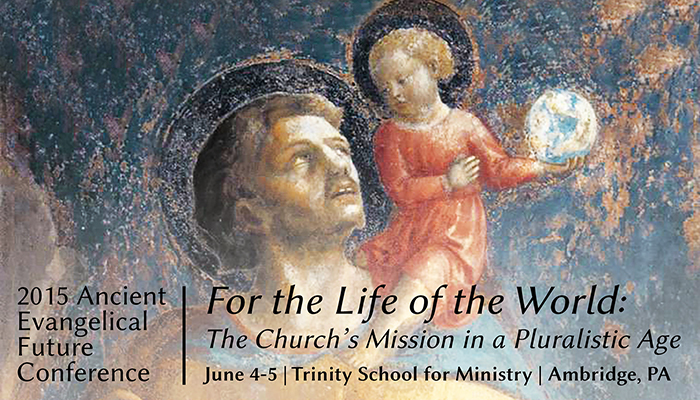 The Conference will be hosted by the Robert E. Webber Center and held at Trinity School for Ministry in Ambridge, Pennsylvania. Framed in the context of Christian worship and community, this conference promises to inform, encourage and refresh all who attend. TSM is the site of the North American Lutheran Seminary Center. Speakers are John Armstrong, Michael Goheen, Grant LeMarquand, Ed Stetzer and Frances Young. For more information or to register, go directly to webbercenter.www.tsm.edu/aef2015 or contact Dawn Bates at 724-266-3838.